Just a quick post to let you know that I will be out of town for a couple of weeks to help take care of the newest munchkin (Truth be told, I think I will mostly be taking care of the three older munchkins:))...So, I don't thin k I'll be spending much time on the computer. I don't know how you young moms do it!?! Adelyn Rose was born on April 15th (7 lb. 4 oz., 20 in.) and we couldn't be happier to welcome the little BEAUTY into our family! We love her already! I can't wait to give her hugs and kisses! Until then...Have a blessed Easter! How wonderful that you'll get to spend time with all of them. Enjoy your Easter and I'll definitely stay tuned for your giveaway. She is precious. I love her name. Enjoy your time with your grandkids! She is just so cute! Congratulations! 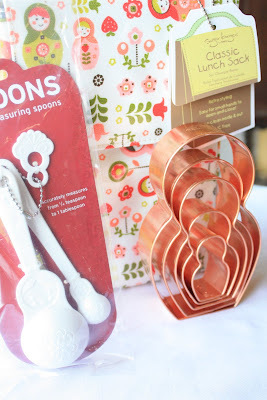 The giveaway looks too exciting - I am in love with anything Russian doll!! She's adorable...! I hope you have a great Easter break and have fun with the Munchkins :). How precious. 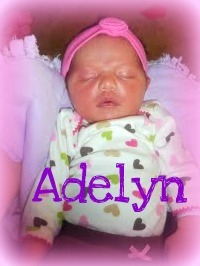 The name Adelyn is just too cute :) Enjoy your time with the grandkids! Congratulations on your newest Munchkin! She is so adorable! Have fun!!! She is so adorable! Have a great holiday! Congratulations! I rejoice with you!!! Congratulations! How fun. Have a wonderful time. Congratulations! Adelyn is just adorable! She looks so beautiful for less than a week old! Have fun. I have been out of town for Spring Break with the kids and have missed sooooo much! I want to make the surfer cookies as we just surfed in Cabo and the funny bunny cookies and I adore how you decorated the carrot cake! You are amazing. Congratulations, Sue! She is gorgeous! What lucky grandchildren you have (BTW, cannot believe you're a grandma, you look like a young mama! ), all the beautiful, yummy treats they'll get to enjoy! What a sweet baby! Congratulations!! Have a wonderful time with your beautiful grandbabies and Happy Easter!! Congratulations Gramma! She is beautiful. Enjoy your time with all your munchkins. Yea!! Babies are such pure joy! Congrats! She is beautiful, and the luckiest baby in the world! Congratulations!! Cannot wait to have you back! What a sweetie! Congratulations to you and your family. Looking forward to that giveaway! What a beautiful little girl and I love her name!! Have fun with the kiddies. I am a follower, and this gear is so cute. Hi Sue! A bit belated, but CONGRATULATIONS! on the new Munchkin! She is precious and I LOVE her name! All the best! Just popped over to see a pic of your new grand!!! She is PRECIOUS!!! I can't wait to hear about how your trip was. What a blessing for your daughter to have a mom like you! You are amazing! And Congratulations!